Added by Indo American News on March 31, 2019. During the days of Navratri and just preceding Dusserah, the truly devout emulate the types of foods that Lord Rama, Sita and Lakshman ate while they were in exile. They had vowed to eat only foods grown in the forest, fruits, honey. Sabudana (large grain or pearl tapioca) is one such food and this recipe is repeated with a few additional tips, just in time for the Hindu holiday season. Whereas chawal di kheer (rice pudding), along with ras malai (cheese in sweetened cream) and gulab jamun (syrup rose dumplings) have become some of the main desserts in many Indian restaurants, the sabudana kheer (tapioca pudding) has not. It is equally as easy, simple and inexpensive to make as kheer. I think the main reason is most restaurants don’t make it in the tasty way that it can be appreciated by the public. And just like chawal di kheer, the sabudana kheer shouldn’t have a thin milky syrup, but must be made properly: thick and sprinkled with iliachi for taste. Sabudana is a starchy substance extracted from the stems of sago palm trees, and then processed into small, circular pellets, which are sometimes called pearls. Tapioca pearls, on the other hand, are made with the starch from cassava, a root crop. It is not a low-calorie food but is used to an energy-boosting ingredient in soups, puddings, side dishes and main entrees. Sabudana is high in carbohydrates, with 86 grams of carbs in each 100 gm serving. Sago balls are larger than tapioca pearls, and both are sold in different sizes, colors, and flavors. In most parts of Southeast Asia, tapioca pearls can be bought already cooked and ready for use but elsewhere, these are sold in dried form and require boiling before use. When dried, tapioca pearls are white and opaque, but after cooking, they swell to almost twice its original size and become translucent. Sabudana kheer is easily made with sugar and cardamom in thickened milk. It is prepared for festivals and many special Hindu occasions though it is especially popular during the navratri time (nine days prior to Dusserah or Ramanavami) because it is made with sago and not grains like rice or wheat, which are avoided by devout people during those days. 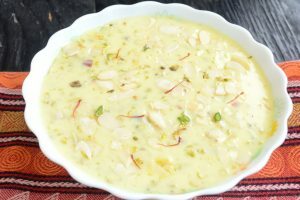 Sabudana kheer has become popular as a chic dessert at weddings where the thickened variety is presented in small earthen dishes and even with a small piece of sona ka varak (gold film). The secret to a tasty dish, prepared much faster, is to soak the sabudana much longer in the water, and to make sure the milk is thicker when you mix it in. If you use the large pellet sabudana, then you should soak the pellets in longer. 1. Pour the sabudana in a bowl full of water, cover and let it soak for two hours so that it swells up. 2. Pour the milk in a saucepan or small pot and bring to a boil over medium heat. Stir occasionally to make sure the milk does not stick to the pot, and let it thicken up a little. 3. Pour the sabudana through a strainer to drain the water, then pour it into the milk and stir continuously for 10 minutes but not more so that the kheer does not get too thick. 4. Now, add the sugar and mix thoroughly. Sprinkle with the crushed cardamom powder. 5. Thicker sabudana kheer tastes best. It can be served hot, but most people prefer to eat it cold, so refrigerate for an hour or two before serving. Although sabudana is mostly used for making kheer, some people, especially those in other South East Asian countries, add tapioca variety pearls to their frozen ice cream, sherbets and iced coffee along with some sweet toppings. For this, the sabudana should not be soaked as the pearls will lose their shape. Just add them to plenty of boiling water – four cups of water for one cup of sabudana – till they are translucent and they will come out nice and round. But to make kheer, be sure to soak the tapioca sabudana in cold water first as the starch will begin to dissolve the pearls immediately and they will lose their shape. Later when you boil them in the milk, the pearls will start to congeal into a milky pudding. It’s the same when using powdered tapioca starch: if you add a teaspoon to room-temperature water, the starch will mix into the water, but if you add a teaspoon into hot water, it will form into a lump.